Fair warnings | Optimism and Co.
Summer is winding down and the nip in the air is saying ‘fair warning’. I am glad for a week’s long respite from Three October workload so I can squeeze in some afternoon walks in the late summer sunshine. Just up the street – 5 minutes – is the Cascade Trail that winds up the side of a pretty waterfall that was once the conduit for Moran’s water supply, from Cascade Lake above, for his mansion on the Rosario waterfront, now a resort. Abject, gaping, rusting metal pipe line guide our way, red-brown in the leafy shadows, some teetering above a drop. Atmospheric, they too offer a ‘fair warning’ – stand back. 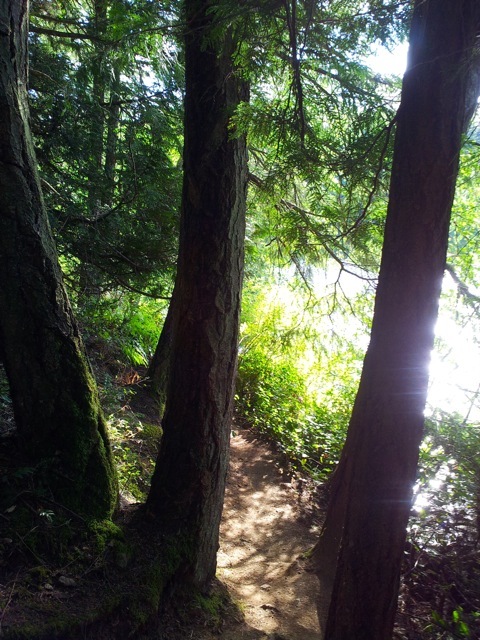 The water is sparkling but the path that winds its gentle way around the lake is cool, sheltered by the leaning woods. Theo is picking his way, sometimes ahead, sometimes behind, chattering incessantly. He loves these hikes, even if he does get squeamish about the giant slugs that loll across the trail like tomorrow doesn’t matter. There are ferns everywhere and cobwebs too – silvery wisps to elaborate shawls from more illustrious weavers. Quietly refreshed, we hurry home for dinner. A dead bird lies on the side of the road home. I could not resist a ‘teachable moment’ even when I was undecided what I wanted to teach. Oops too late, so begins a deliberation on what happened in hell and heaven and whether it was forever. “Yes, that’s it,” I said. That’s about the right pitch for now. Fair warning too, I guess. This is great, Ho-siao-che! I shall be following your blogs with much amusement! Keep it up! I see a book brewing somewhere!